I found this photo online and thought it captures the essence of Japanese relationships. 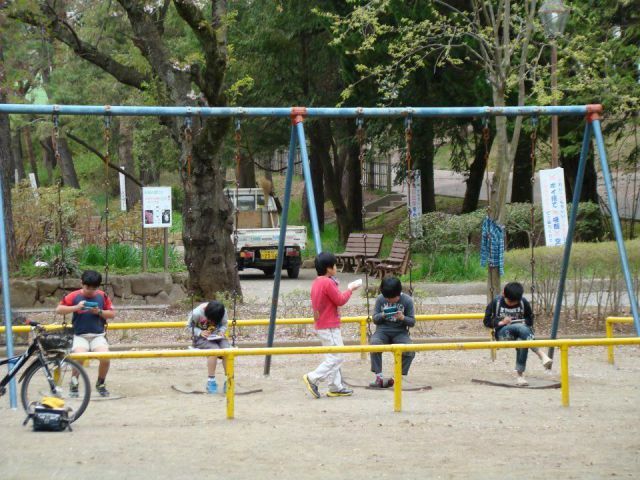 This is a typical scene of school boys engrossed in their handheld games. The good news - at least they are outside in the fresh air and sunlight. Are they playing a networked game? Don't their necks hurt? Do their thumbs get tired? This isn't too different from how their adult counterparts behave in public spaces such as trains and restaurants. Technology, it seems, has tricked us into thinking we are more connected, when in fact we are more isolated than ever before. Our moods are dictated by the number of Likes and comments our posts get. Pray that technology might be used in a way that strengthens relationships. More importantly, pray we can model to the Japanese how to have relationships the way God intended.